Whose Bad Idea Was This? Making a television series out of a terrible book is a waste of time, money, and talent. Okay, maybe I am being a bit harsh, but I literally about fell out of my chair when I saw today that J.K. Rowling’s “The Casual Vacancy” is being made into a television series. 1) I cannot bear to throw a book in the garbage (I am going to repurpose it). 2) I do not want to donate it to my local library and risk anyone else reading this rubbish. From what I am understanding, Michael Gambon, aka Professor Dumbledore, has a leading role. What? Why? 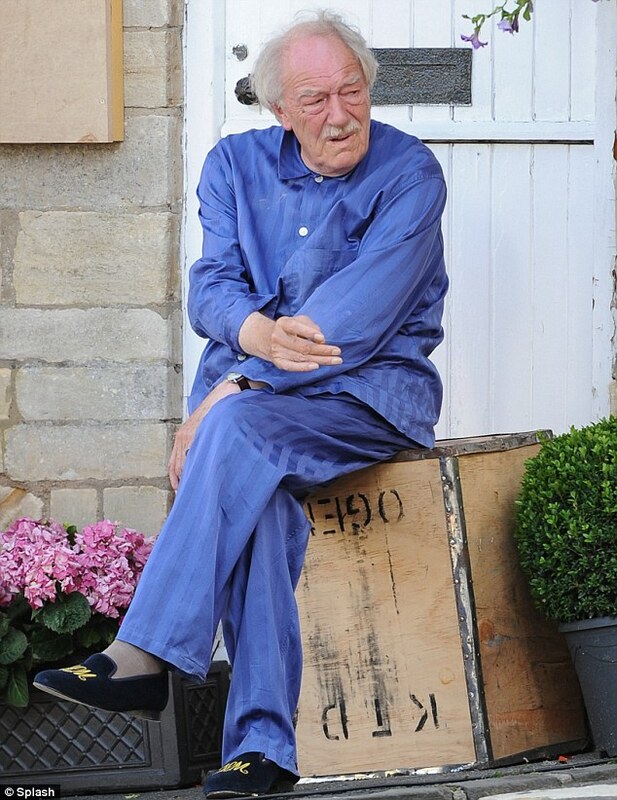 Michael Gambon on the set of “The Casual Vacancy”; yes, in his pajamas. He is Professor Dumbledore. He should not be recycled into your next book. People will expect a Dumbledore-type character, which he is not playing. People will think (Okay, I am thinking) you could not find anyone else to act in this television series. Okay; I just did not like this book. I wanted to like it; I tried to like it. But I could not. She could have written it under a pseudonym like she did with “The Silkworm“, and not knowing it was J.K., I still would not have liked it. I am really curious if I am the only one who finds so many wrong things going on here. And I would really love to hear from someone who liked this story. Honestly. I want to know if I missed something, judged too quickly, or just did not get it. Thanks for sharing Dave! I have seen reviews that are either love it or hate it. I don’t want to say I hated it, but I really took my time reading this story so I could absorb everything going on, and I just could not like it. Thanks for sharing your opinion! I would really like a whole bunch of people who liked it to tell me why. 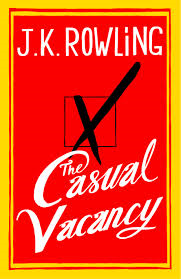 I have to admit that I didn’t particularly enjoy The Casual Vacancy. I found the large number of characters confusing and it just wasn’t my type of book, plot-wise. Whether the sales figures are down to Rowling’s previous success or the hype and positivity and strong marketing campaign for TCV, I don’t know (I suspect a combination, of course), but it’s hard to deny that the book is a bestseller and therefore it’s not too surprising that a series is being made. I probably won’t be watching it, no unless the previews/trailers are particularly good, but I guess there are a lot of people who love the book and will enjoy the series. Also, we have to trust that Gambon can play this new role without drawing to mind images of Dumbledore… which I’m sure he can. Sorry, this turned into an essay! I’m not really sure what I’m saying here. I guess that I didn’t much like the book, but I can accept that other people loved it and therefore will love the TV series. Thank you for sharing Teresa! I was confused throughout the whole story as well. I didn’t like it either, and like you my dislike really disappointed me. I mean, this is J.K. Rowling. She gave us Quidditch, for goodness sake. But I found this book so dry, so lackadaisical in pace, that I couldn’t finish it and returned it to the library. I loved the HP books & movies. Thoroughly enjoyed the 2 Cormoran Strike ‘tec novels and can’t wait for #3. However: I chose NOT to read the Casual Vacancy novel based on the book blurb: the characters sounded very unpleasant and the theme uninspiring. I agree with yr comments on Michael Gambon – no offence to him, he’s a good actor – but surely there are other choices? I read this book with my Book Club, and none of us liked it. Since my husband gave it to me as a Christmas present and wrote a sweet note on the inside cover, I can’t give it away or donate it. Maybe I should have him read it and if he isn’t enamored with it either he’ll be all right with me tossing it. I would definitely hold on to it for that reason too! I find it interesting that your whole book club did not like it. Thanks for sharing Nancy! I didn’t like it either. Not at all. I couldn’t even get past the first few chapters. But not every book an author writes is going to be great. She obviously found a special place in her imagination and her heart when she wrote the Harry Potter books. Maybe next time. Her “Silkworm” series featuring Detective Coroman Strike is very good! You may want to check it out if you haven’t read it yet. I didn’t love it, but at least I can respect it. It was obviously something that she felt she needed to write, and I think she did a fantastic job portraying a small-town tempest-in-a-teapot that grows into the storm of the century. Much like Stephen King, Rowling is very adept at writing believable, deeply flawed, three-dimensional characters, and she really hits the nail on the head with those characterizations here. Honestly, I feel like most people who “hated” this book either only read a few pages or didn’t read deeply enough. Once the storylines began coming together and the image of the town and its politics came into clearer focus, it was a lot easier to see what she was getting at—and a lot easier to get invested in the story. You can dislike the story, but I think the book should at least be respected for the incredible amount of work Rowling obviously put into it. As far as the show goes, I wouldn’t have recognized Michael Gambon as Dumbledore without the beard (although that’s possibly because I’ve refused to watch the Harry Potter movies after seeing the fifth—if you want to talk about rubbish, let’s talk about those) and I’m sure he has many reasons for wanting to be part of The Casual Vacancy other than “they couldn’t get anyone else,” because there were definitely people out there who truly enjoyed this book. I think it’ll actually make a great television drama, though only if they actually end it where it ends instead of dragging it out for more seasons. It’s not the type of show I would watch, but neither is “Downton Abbey” or “Game of Thrones” and they both have plenty of viewers. I really didn’t expect anyone to take offense to my post, and I certainly hope you didn’t either! I respect her for her writing talents, I just did not like this story. I did read the entire thing, right to the very last words. I felt that the further into the story I got, the more confusing her mixed together storylines became. I have other favorite authors who have written stories I didn’t care for; it doesn’t mean they have lost their talent, and that is not what I was inferring. It simply means they wrote a story that I did not find enjoyable. Many others seemed to feel that casting Michael Gambon in this television series is a bad idea. It is all over the internet; feel free to look into it. And thanks for correcting my spelling error 🙂 I had to submit that post from my tablet because my laptop was misbehaving, and for some reason it spell corrected it to that, and also would not allow me to go back and edit it. I will go fix it now since my laptop is being cooperative again. I really wanted to love this book too. I got 3/4 of the way through and couldn’t read anymore. And I spent a small fortune to get it! I rarely buy books and had such high hopes for this one, because well… it is J.K. Rowling were talking about! Oh well… never again will there be as great a book series as the Harry Potter books. I need to just resign myself to this fact and stop dreaming! Sigh…. I agree Michelle, but have you read either “The Cuckoo’s Calling” or “The Silkworm” that J.K. wrote? These two stories are a great start to a new series for her. I think we all have to accept the fact that there will never be another Harry Potter, as hard as that is! It is definitely my favorite set of books! I haven’t read them, as I am afraid they will be disappointing too. I will have to check them out from the library I guess and give them a try. I also found The Casual Vacancy to be unreadable. The death of the only decent character meant there was no longer a character with whom I could empathise, since the rest are all unpleasant. I watched the first episode of the series last night. Well, my wife and I watched the first forty minutes before we looked at each other and agreed that, with not a single person on screen we cared about, we’d lost interest in the piece. I’ve no doubt the intent was very worthy, but I prefer to have some entertainment when I read and watch, and this particular book/dramatisation appears to offer none at all. All doom and gloom and unpleasantness isn’t a great way to attract readers or viewers. I have to say that I am NOT familiar with either the book or the actor. But I so DID enjoy the way you spoke your mind about it! Made me smile. Crisp, to the point, no apologies: I like that! Thanks for reading and liking my post! I have not heard too many positive things about the show so far either.